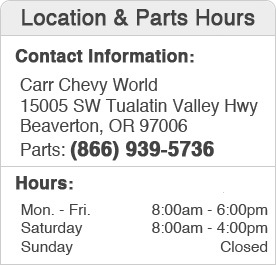 Thank you for visiting the Parts Center page for Carr Chevrolet where we are proud to be the premier Chevrolet Parts supplier for the greater Portland, OR area. Our parts professionals are car enthusiasts so we know there is no need to ask for engine size when a customer is purchasing windshield wipers. The world class engineering of Chevrolet and GM vehicles deserves only the best so we make sure to keep a wide variety of genuine GM and Chevrolet parts and accessories in stock. Order online and we'll have your order waiting at the counter. Getting the most out of Chevrolet and GM vehicles means keeping up with regular maintenance. Take advantage of our regularly updated parts specials to save on the things we use most like oil filters. Genuine Chevrolet and GM parts are exactly what the world class engineers developed for these vehicles and it only makes sense to maintain Chevrolet and GM vehicles with the right parts. Stop by and grab a set of genuine Chevrolet or GM brake pads and be ready to save rotors from damage. Modern Chevrolet and GM vehicles have sophisticated cooling systems that require specific coolant so don't take chances with the wrong stuff, take the short drive from Tigard, OR and be sure to get the right Carr stuff at the Carr Chevrolet parts department. Few things are as frustrating as getting back to the project only to realize that you were sold the wrong parts. The professionals at Carr Chevrolet know their business and can even determine a vehicle's details with only a VIN number. Trust the experienced experts at the Carr Chevrolet parts center to help get the job done right the first time. Genuine Chevrolet and GM accessories are also abundant at Carr Chevrolet. From running boards to roof racks, the right accessories not only make Chevy and GM vehicles more versatile but more valuable as well. When it comes to installation of any genuine Chevrolet and GM parts, the factory trained technicians in our service department are ready to quickly and conveniently take care of the installation with expert precision. Take the short drive down Highway 8 from Hillsboro and find out more at Carr Chevrolet. Being the premier dealership in the Portland Area is about more than good deals and service. Aside from our outstanding customer service and some of the industry's best deals, we maintain a commitment to our community by partnering with a variety of non-profits and community organizations. Take a look at what customers are saying about us then visit our parts department to see how we can help repair, maintain, and improve Chevrolet and GM vehicles. Factory trained technicians are standing by in the service department to help with any installation that may be required. When the time comes to upgrade, be sure to check out our massive selection of new Chevrolet vehicles with all-new models just around the corner. We also keep a wide inventory of quality used and certified pre-owned vehicles to choose from. Give our parts department a call at (866) 939-5736 to check stock and place orders. We will be happy to have your order ready and waiting at 15005 SW Tualatin Valley Highway, Beaverton, OR 97006.